The Art Guild Show and Sale is held every year to showcase student artwork and raise money for supplies and activities for members. On Nov. 16, the Art Guild students sold their individual pieces to the community and Southeast students and faculty. 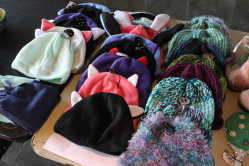 Hats for sale by artist Nicki Szendzial at Southeast’s Art Guild Annual Show and Sale on Nov. 16. The Art Guild is an organization that allows art students to gain experience presenting their artwork through exhibits and become more involved while building their portfolios. Some of the clubs that fall under the Art Guild are the Clay Club and the Sculpture and Printmaking Club. Southeast art history professor Dr. Joni Hand said in order for their art to be displayed during this show, the student must be a member of one of the clubs offered through the Guild. There is a variety of art at this event but the majority of the art includes pottery, sculptures, paintings and prints. Nicki Szendzial, a Southeast student and secretary of Art Guild, showcased all of the projects she has been working on within the past year. Most of her work showcased a specific theme. 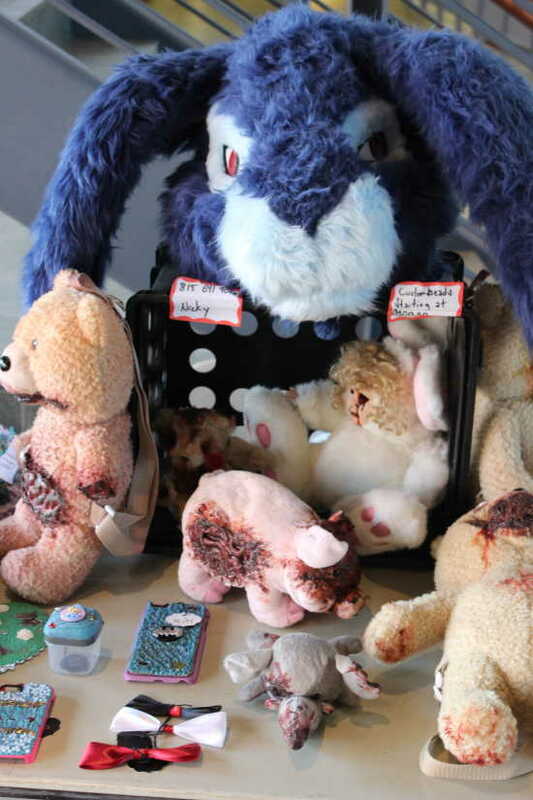 Some of Szendzial’s artwork involved turning stuffed animals into a zombie-like creature. Stuffed animals for sale by artist Nicki Szendzial at Southeast’s Art Guild Annual Show and Sale on Nov. 16. “It started off with a stuffed animal that my dog ripped up,” she said. Instead of letting it go to waste, Szendzial turned it into a form of art. She had around 20 hats and several stuffed creations for sale that she has worked on throughout the last year in her spare time. 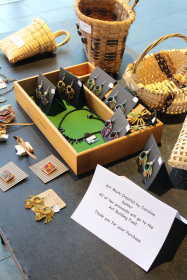 Jewelry and baskets for sale by artist Caroline Kahler at Southeast’s Art Guild Annual Show and Sale on Nov. 16. She said some projects can cost up to $100 for supplies alone. The cost of these projects is one of the reasons why raising money through this event helps to support the artists. Hand said not only do these funds help students afford the supplies but it also helps the Art Guild provide the students with fun meetings and events. 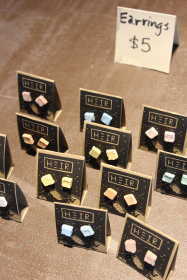 Earring for sale at Southeast’s Art Guild Annual Show and Sale on Nov. 16. “The Guild gets 15 percent and the students get 85 percent of the proceeds,” she said. They have one “Show and Sale” per semester, one before Thanksgiving and the other around the same time during the second semester. The second semester showing doubles as a chili cookoff. For $10 attendees will receive a bowl made by ceramic students and have access to unlimited chili. 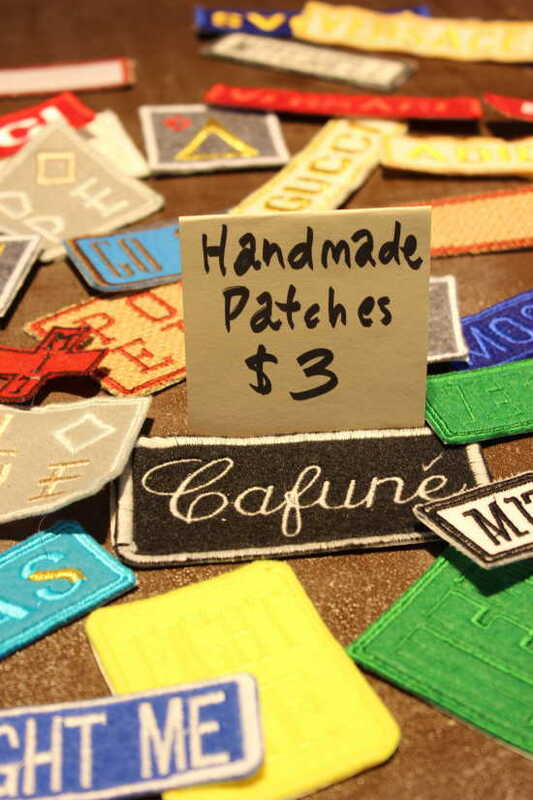 Handmade patches for sale at Southeast’s Art Guild Annual Show and Sale on Nov. 16. Hand said that the artwork changes every year depending on the students participating. She said it is always heavy in pottery, however, there is more variety being showcased this year. “Out of the five years I’ve been faculty advisor, I think that this one is probably the most eclectic,” she said. The artwork changes annually based on what the student interests are. She said the work does not have to be made in a class, noting it can be made on their own time. This gives the students an opportunity to create something outside of their studio classes. 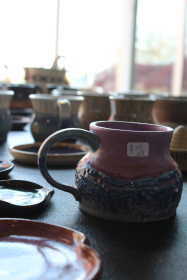 Pottery for sale at Southeast’s Art Guild Annual Show and Sale on Nov. 16. The Art Guild will be holding one last activity before the semester ends. They will host an event with yoga and ice cream to serve as finals week stress relief.